Go to the head of the class by fueling yourself with this delicious and nutritious smoothie! I love to learn new things, especially regarding nutrition, and have embraced the idea of life-long learning. While I’m not currently attending a formal school, I often have to rush out the door in the morning. This is where smoothies are a life saver for me. It’s all too common for people to skip breakfast or grab something unhealthy and run out the door. Some days you may be that crunched for time. Most days you have 5-10 minutes to whip up a healthy smoothie that will set the tone for your entire day. Whether you’re going to school, work, or off to run errands, being properly fueled is paramount to performing at your best. I noticed a big difference when I switched from Rice Krispies or Wheaties and milk to smoothies. Looking back I often wonder how I managed on such little nutrition for my body and brain. Smoothies can also be a godsend for parents who need to create a quick meal for kids before scooting them off to school. This recipe includes plenty of healthy fats to keep you satiated and nutrition for your brain to function at its best. I included a few more optional add-ons than normal to take this smoothie in several different healthy directions. Enjoy! 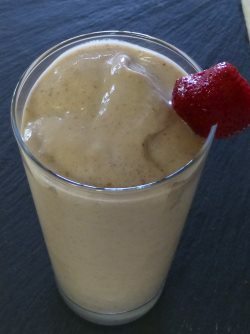 I’d love to know if you try this back to school strawberry smoothie and how much your grades improved :) Please leave a comment below. Happy Blending!